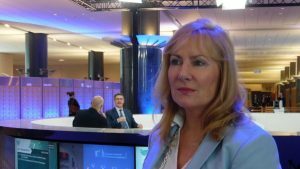 British MEP Janice Atkinson has called for a programme of “mass information” to stem the tide of migrants flocking to Western nations, telling them “think again, Europe is closed”. As latest figures showed up to 6.6 million migrants are waiting in countries around the Mediterranean to make the perilous crossing by boat into Europe, the Independent MEP slammed the “dangerous myth” that the tide of migrants was receding. And she said now was time to follow President Trump’s Mexican border wall pledge by building “thousands of miles of walls” to keep Europe’s frontiers safe as well as educating migrants on the unacceptable strain mass immigration was placing on jobs, houses, welfare and healthcare. “In an attempt to paper over the EU cracks and counter the sweeping advances of populist parties in Italy, Austria, France and Germany, the left-wing media is creating the dangerous and disingenuous narrative that migration numbers are dwindling,” Atkinson said. “This is not true – it is a myth deliberately propagated by the tax-payer funded people smugglers of the NGO’s who are working directly against the governments and peoples of Europe. “The truth is that there are around 6.6m people in countries in and around the Mediterranean all waiting for their opportunity to get into Europe, by whatever means. They are aided and encouraged by the human rights industry through unaccountable NGOs. “The only answer now is to build walls on the southern borders of North Africa and on Europe’s frontiers. And the EU must build European visa/asylum centres within these walls in Africa. And in a message directed at migrants in countries such as Morocco, Turkey, Tunisia, Libya, Egypt and Algeria, the former UKIP politician said: “A programme of mass information must be clearly conveyed to Africa making clear that there are no jobs, houses, welfare or healthcare. In short, if you are thinking of trying to get into Europe – then think again. She added that for too long European voters had watched as the EU failed to properly deal with the influx, adding that “alien cultures and practices” were undermining not only infrastructure but also culture, safety and way of life.